In 1999, we went with some friends to Galveston's "Dickens on the Strand" - a 19th century celebration each November where you are invited to dress up in period costumes and celebrate Galveston's rich history on its most famous street - "B street." In the 1800's, B Street was renamed "the Strand" to give it a more elegant sound reminiscent of a famous shopping district back east. Galveston's history is quite fascinating because it was often seen as an off shore resort where the laws of the land didn't quite reach. Not only was it the largest Cotton port in the world "in the day," it also became a play ground for those who wanted to deviate from the accepted and expected path for the Victorian era. Depicted here around the end of the 1800's in Evening on the Strand is a couple of families out for the evening to enjoy the hustle and bustle of incoming ships, immigrants, new items of interest from around the world, busy shops and lots of excitement. I'm the man on the left looking down at two of his sons in the cart, and my wife Bonnie is chatting with her friend Jennifer as her husband is going to try to flag down the trolley. Even Bonnie's parents are depicted walking away- towards the trolley in the center of the scene. I feel much nostalgia as I gaze on the "old days" like this. Not only are these scenes a thing of the past as giant tankers bring containers of goods in huge mechanized ports where you are not allowed, but even the towns themselves are lost to fire, time, or even Storms. Galveston was decimated in 1900 by a killer storm - still the highest death toll of any natural disaster in the USA to this date, but the excitement and beauty of this town still exists because of mans determination to rebuild and make things beautiful. 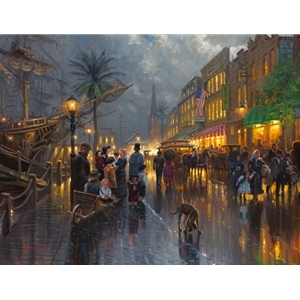 I wanted to capture the busy-ness and excitement of an Evening on the Strand as it actually occurred with my family and friends, just a hundred years later than depicted.